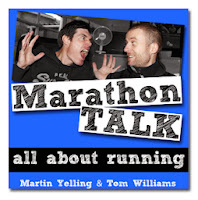 Presented by Martin Yelling and Tom Williams, Marathon Talk has just passed two huge milestones- its two millionth download and 200th episode- and has become an integral part of my training and running life since I first discovered it just over eighteen months ago. As experienced marathoners and multi-sport athletes- both having sub-2:50 marathon PBs and multiple Iron Man finishes to their names- Martin and Tom have a vast wealth of knowledge to share with the running community. The great thing about the show, however, is that you don't have to be a super-speedster to listen in; in fact, you don't even need to be a marathoner. Martin and Tom have done a great job of making the show as inclusive and community-based as possible, bantering away and talking about anything and everything to do with running of all distances, on all surfaces and at all levels. The show follows roughly the same format each week, featuring that week's running news, a 'Training Talk' and an interview. In the early days of the show, interviews tended to be with the elite runners in Martin's little black book of running contacts (he is, after all, married to two time Olympian Liz Yelling). However, as the show has evolved and grown in reputation, its interviewees have diversified and, along with current elites such as Paula, Haile and Mo (no surnames required! ), have included running legends such as Ron Hill and Chris Chataway, celebrity runners (most recently Ronnie O'Sullivan), sports scientists (Prof. Tim Noakes gave two of the most fascinating interviews you will ever hear) and even non-elites with interesting stories to tell. Speaking of celebrity runners, a regular highlight of the show is 'Tony's Trials', where Tony Audenshaw, who plays barman Bob Hope in Emmerdale, rants, raves or sings about his running escapades from that week. Tony is a bit of a legend in the running community, has a sub-3 hour marathon PB and is what your mum might call 'a bit of a character'- as anyone who has seen him running the London Marathon dressed as a baby or schoolboy will attest. As a result, his weekly Trials are at turns hilarious, bonkers, baffling, and, as with his recent recording from the Bullock Smithy Ultra, highly emotive. As mentioned, one of the main strengths of Marathon Talk is the community that has built up around the show. In addition to a dedicated website, with over 12,500 registered users, each week's show gives listeners the opportunity to 'Rate Your Run' out of ten, and claim a coveted place on the 'Listener Podium', whereby the five quickest male and female listeners from the previous weekend's marathons are ranked in order. More importantly still, Martin and Tom have also come up with two annual running challenges: 'Jantastic' and the 'Magic Mile', both of which are 'just for fun' but designed to motivate and reward participation. I honestly think that Marathon Talk has improved my running to the same extent that joining a club has; in fact, I may not have had the confidence to join my club without hearing Martin, Tom and their various interviewees talk about the benefits of running with a group. All of the advice that they dish out is based upon experience and it has helped enormously to hear from people who have worked hard at their running and seen their results improve as a result- Tom is a great example of someone who started running later in life but, through a great deal of dedication and commitment, has earned himself excellent marathon and Iron Man PBs. I'm also in no doubt that the three months of Jantastic contributed to my PB in Manchester- it's amazing to think that a virtual challenge against strangers could be so motivating, but it definitely encouraged me to lace up my trainers eight times a week. Back in July, I was fortunate enough to meet and spend time with Martin, Tom and Tony after winning a place on the Marathon Talk Thunder Run team. All three of them are just as friendly, genuine and passionate about running as they sound on the show. I know that they work extremely hard on the show and their success is thoroughly deserved. So congratulations and thank you, Marathon Talk- here's to the next 200 episodes! Marathon Talk is released every Wednesday and is available to download for free either directly from the Marathon Talk website or via iTunes. What a great post! I love marathon talk- I started listening when I was training for a half and it was what persuaded me to try a full one. I totally agree that it is not elitist in the slightest; their banter is great, as is their encouragement and training tips. Thank you, Maria- glad you liked it. Best of luck with your running!